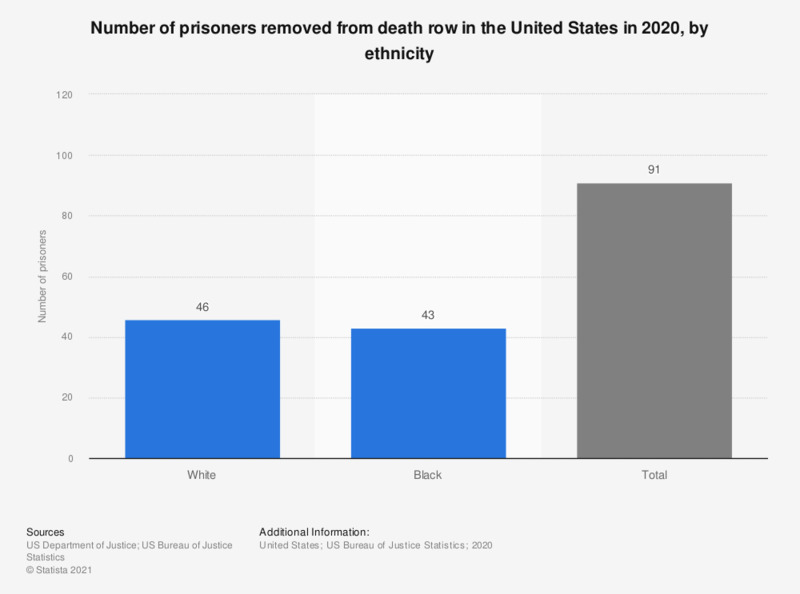 This graph shows the number of prisoners removed from death row in the United States in 2016, by ethnicity. In total, 70 inmates were removed from death row in 2016. *Includes 19 deaths from natural causes. The data for white and black inmates include persons of Hispanic/Latino origin. The data for the total number includes American Indians, Alaska Natives, Asians, Native Hawaiians, and other Pacific Islanders. Death penalty in the U.S.
Everything On "Death penalty in the U.S." in One Document: Edited and Divided into Handy Chapters. Including Detailed References. Statistics on "Death penalty in the U.S."
Violent crime in the U.S.
Property crime in the U.S.
Are you in favor of the death penalty for a person convicted of murder? Do you think the death penalty is morally acceptable or morally wrong? How often do you think that a person has been executed under the death penalty who was, in fact, innocent of the crime he or she was charged with - do you think this has happened in the past five years, or not? Do you think that the death penalty in the United States is now imposed in terms of legitimacy or not?